Important notice! This post is probably outdated and my examples don't work due lack of "https". This works now with PHP SDK (v.3.0.0) and up. I have changed this post after initial publish. This is simple example of facebook iframe application which is not using FBML and it has link to authorise and gain access to "publish_stream" permission. It demonstrates how to use new php-sdk library and graph API for that. I was pretty much puzzled at first, because there was many ways and apis to achieve this. Documentation and examples are confusing at moment to get started with apps. Especially when it comes to iframe app which has to ask permissions to access user data. Confusion is even greater because there is old way and the new way to do it. I wasted many hours to figure things out and get this basic sample working. Therefor I share this example and hope it saves hours for them who are also lost in documentation and examples. This app is published in facebook at moment. Feel free to check it out before trying it. Or download the source code right away. It is also aivable at github. If user has not logged in or not given any permissions for app, it will show following contents. You could do automatic redirection, but I find this kind of approach much more user friendly because it can see (if presented) upfront what value this app promises. After clicking allow link, it will direct user to permission request dialog. Notice the target parameter in that link. If it is not set "_top" it will show one extra (blank) FB page which is confusing. After allowing this app, it will redirect back to previous page and this time we can do some interesting stuff. Like posting post on user's wall and accessing friends list. Of course there is much more you can do. So you want to try this out and start developing your own cool facebook application based on this. Here is quick step-by-step walk trough. 6. Fill in essential information form and click "Continue" button. 11. Fill in config.php which variables should be pretty much self explanatory. Values can be found here after clicking on your app. 12. Save and you should be done. Go have a test-drive by entering newly created FB canvas url into browser. great, clear, hands on! tested it with latest facebook.php v 2.1.2 and its working just fine. Where did you use iframe? I didn`t see the iframe. It is called iframe app because it runs inside facebook page trough iframe. This exception tells exactly what's wrong. 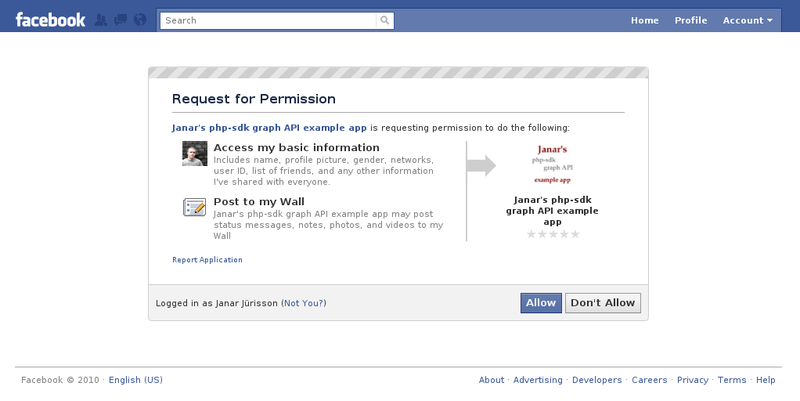 Your servers PHP installation needs JSON extensions in order to get Facebook PHP-SDK to work. It's not SDK issue. Ok - great stuff very easy to follow. My question is this. If I want to put your application on my wall as a tab so that others could see it. For example, if I created a shopping app that I want my fans to see - how would I do that? I can't seem to figure that out. Adrian, yep. This won't work with the new API, which doesn't use getSession() anymore, apparently. "an error occurred, try later"
Thank you guys pointing out SDK/API change. Even the facebook application managing page had been changed. I made some corrections in post and also in package/online demo. What can I do? I'm using your latest version. Made minor correction. Should be fine now. Now the redirection is fine but when the web browser is redirected to http://apps.facebook.com/my-fb-site the "$user" variable is zero. Thanks for everything I've already fixed the problem. I keep being redirected to the page with the 2 links and the text. No code in the URL either.. Thanks. But I have not used FBML tags somewhere yet. thanks a lot man..u r a saviour..
what i put in action=""
now my problem is: i get this: $user = $facebook->getUser(); fine. do you know what the problem is and how i can fix it? Are you sure they are accpeting? Users should be redirected to that url when it clicks "dont allow" button. In my sample I have not covered this yet. but its goes first time at my server why? From a particular webpage, I would like to offer users to log in with their facebook account. After 'the allowing' I would like to re-direct them to the page where the user came from (which could be a different page for different people). Is this possible? Hope you know if this possible or not! I can confirm this works as of 19th of August 2011. From October 1st onwards though facebook will require a secure canvas url as well as the regular one.. What can we do about it? You can see the #_ chars? why? Hey! i have a question! i will show my oauth dialog via iframe in php. i will use fancybox. Welche parameter muss ich setzen. Was ist zu beachten ? What changes have to be made to the script? I Guees there have been changes from facebook.com since the script won't direct back to the app after authorizing. trying to do it on www.be-athens.gr! hay dose any one know how i can automate a message or a app request using graph API i have built and an app that has a form where you can enter your friend in to a contest. now i am trying to find a way that i can notify the friend that has bean entered the form automaticly on submition of the form is this passable?? That seems like a nice post. I am stuck as the app is not able to proceed further in base_facebook.php and gets caught at curl exception. Would be great if you could temme how to fix it? 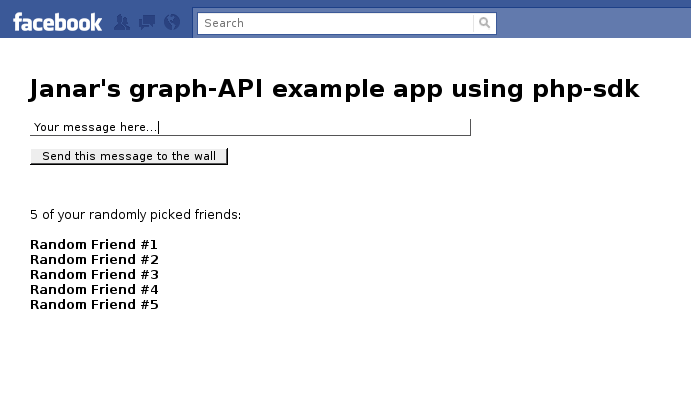 Facebook PHP sdk needs php CURL extension and this must be provided by your server admin/hoster. Google it a bit- this is actually a common problem. Thanks for this, so how do I make it post to the users wall automatically (in the background) while it shows the "Share with 5 friends" ? For automatic posting you need to implement some kind of logic and combine it with CRON for example. Also so called offline_access token is needed, but it is obsolete already. New solution is somewhat different and I have not investigate it. Thanks for the code. If I want to display friends picture along with the name. What do I need to do to achieve it. I have some input from my side. Along with things done abov we also need to include base_facebook.php file from PHP_SDK. Because facebook.php file somewhere references this file. I have not heard about Facebook ‘iframe application’. You have written it very complicated, I am confused. May be I am not familiar with it that’s why I am confused. I will try to download the application and see how it works.